What Trees & Plants Are Native to Austria? Austria is a country that is located in central Europe. The climate in Austria is temperate and fairly cool. The alpine climate predominates in Austria, since over half of the country is located in the Alps. Winter temperatures can get as low as 10 degrees Fahrenheit but summers can reach nearly 90 degrees, which makes the weather perfect for many types of plant life. The edelweiss (leontopodium alpinum) is the official flower of Austria. It is a member of the sunflower family. The flowers and leaves of the edelweiss are covered in tiny white hairs and appear to be woolly. This characteristic helps to protect the plant against the cold. The plants grow up to 8 inches tall and are short-lived perennial plants. 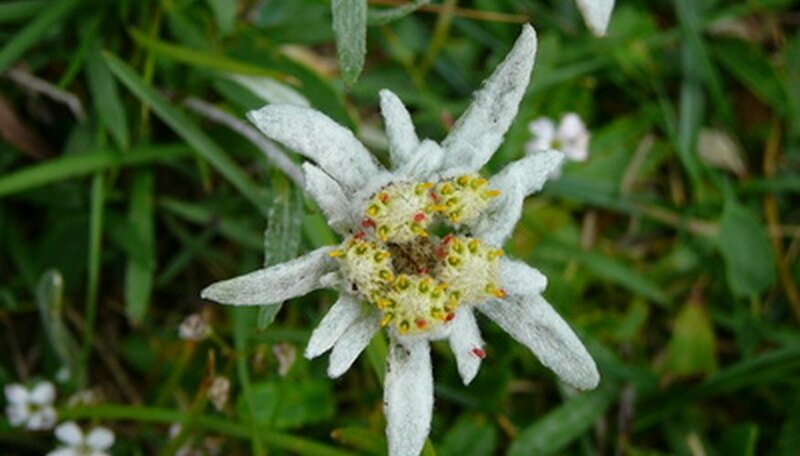 Edelweiss grows in rocky areas and prefers full sun and well-drained soils. The gentian (Gentiana verna) is a perennial plant that is native to the alpine regions of Asia. The plants typically grow in the wild and are hard to domesticate. Gentian is a very hardy plant that prefers full sun to partial shade and likes rich, well-drained soil. It can often be found in rocky cliffs. The flowers grow in clusters on stalks up to 7 inches long. Colors include purple, white and yellow. The arnica (arnica montana) is a perennial flower that grows up to 1 foot tall. It is often referred to as leopard's bane. The flowers bloom in spring and are yellow-orange and grow up to 3 inches in diameter. The leaves are downy and bright green and grow up to 4 inches long. Arnica plants produce a seed-like fruit that is contained in a spiny ball near the base of the plant. Arnica prefers bright sun and well-drained soils. Heather (cassiope tetragona) is a shrubby plant that grows up to 2 feet tall. The flowers can often be found growing in clusters along moors and bogs. The purple flowers bloom in early spring to late summer. The plant prefers full sun and moist, well-drained soils. Heather is very adaptable and can also grow along rocky coastal areas and cliffs. The Austrian pine tree (Pinus nigra) is an evergreen tree that is tolerant of most soil and climate conditions. It can grow up to 60 feet tall and 20 feet wide and is also commonly called a black pine. The tree is conical shaped and has pine needles that are up to 4 inches long. The fruit of the Austrian pine is a 3-inch cone. The tree prefers full sun and moist, well-drained soils. The English yew (taxus baccata) is a n evergreen tree that can get up to 70 feet tall. The bark of the yew is scaly and brown and the leaves of the tree are needle-like and deep green in color. The tree blooms in spring and produces a small seed cone that is modified and contains a single seed. All parts of the English yew are highly poisonous to both humans and pets and can be fatal. The English yew is a tree conifer but it is often pruned as a shrub. Edelweiss Growers: What is Edelweiss?